Regular vs. disabled accounts. This report shows the ratio of regular vs. disabled user accounts. Regular vs. locked accounts. The ratio of regular vs. blocked\locked accounts. With/without password. Shows the number of accounts with blank and set passwords. User vs. machine accounts. The ratio of user vs. system accounts. Active vs. expired passwords. Report with statistics on accounts with active vs. expired passwords. Regular vs never expired passwords - compares regular user accounts against those with 'Password never expires' flag or unlimited password live date set. Administrators vs. limited users. This report gives comparative statistics on accounts with administrative rights vs. restricted user accounts. Account types. Shows machine, user, administrator accounts, etc. Account status displays active against disabled accounts. It is the same as the first report in the list but contains no additional pane on disabled accounts. Top 10 active users. Report on the top 10 most active OS users. The statistics is gathered from the system's internal user logon counter. Bad password logons. Top 10 users with the highest rates in the failed logon counter. Last 10 failed logons - displays the list of user accounts last tried to logged on unsuccessfully. 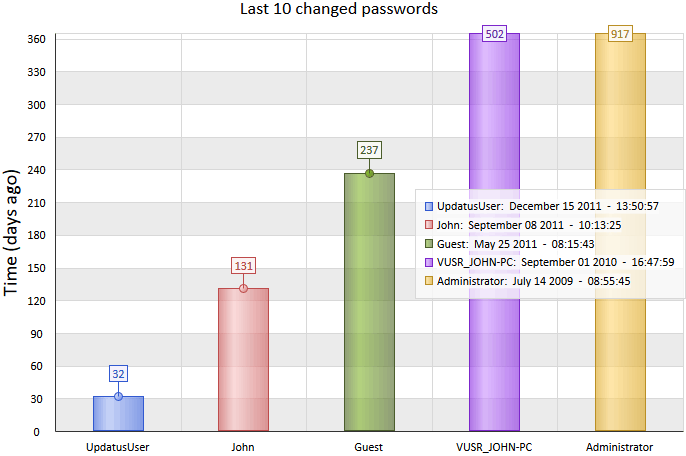 Last 10 changed passwords - shows the time of last 10 users who changed their passwords. 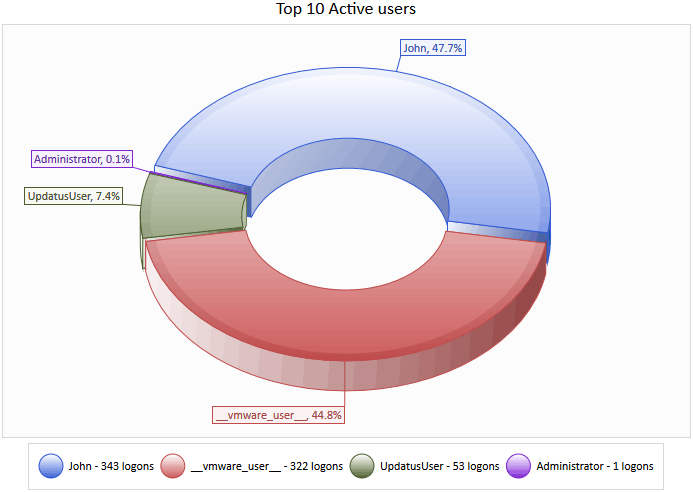 Last 10 logons - displays the time of last 10 users who logged on the system successfully. Last 10 logoffs - the time at which the last 10 accounts logged off. Expired soon accounts - user accounts that will expire soon. Logon activity groups users by time passed since the last logon to the system. Password age report groups users by time passed since last password set/change.